I remember the excitement I felt when Patagonia started making shoes. The same great quality found in their outdoor gear and clothing would soon support my feet! Now, one of my favorite brands available on OnlineShoes.com is supporting one of my favorite resources for our children Healthy Child Healthy World. Patagonia will donate $10 to Healthy Child Healthy World for every pair sold of shoes or boots sold through 10/17/2011! Furthermore, we have a pair of shoes or boots to giveaway, as well as Healthy Home Book! WOOT! I love the Patagonia Addie Rider High boots! A tall, zippered boot with a nod to equestrian style, the Patagonia Addie Rider High boot delivers everyday comfort and versatility. 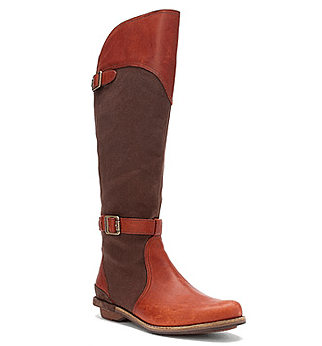 This women’s tall boot features a full grain, waxed cotton upper with a glove-like leather lining. The steel shank provides underfoot stability and natural flex in the forefoot. Stitched outsole construction delivers durability while minimizing the used of solvents and adhesives in the Patagonia Addie Rider High boot. I love my new boots! The red color is more subtle in person than on online, which I like better in person. The side zipper makes entry easy, as well as pulling down pant legs inside of the boots. They do seem to run a little small if you want to wear thick socks with them. Would I buy this product? Yes,but they are expensive, so why not win a pair! Do you want your very own pair of Patagonia shoes or boots, as well as an incredible resource for a healthy home? 1. Follow OnlineShoes.com on Twitter or Like it on Facebook. 2. Follow Eco Child’s Play on Twitter or Like it on Facebook. 3. Leave a comment to this post about which pair of Patagonia shoes or boots you would like to win! The winner will be selected randomly on Tuesday, October 18, 2011. Oooo! I’d love a pair of the Better Clogs or the Better Clog Janes. So purty. I would like the W’s Lugano Lace High Waterproof boots. Wow, those are nice boots! I would die for a pair of the das boot bison… they’d be perfect for rainy day winter trips out to disneyland with the wife and kiddos! I like Addie clog or better clog. Following you both on fb:heta s.
Oh no.Oh NO!I LOVE Patagonia and I am slowly turning into a show junkie after 19 years of living in Hawaii and only wearing slippers(flipflops,zoris etc).Especially boots.Drool!I love them all BUT the Addie Ruffle in Peat Moss…if I don’t win them now I am going to have to start saving for them! I already follow you on Twitter and FB and I know follow Onlineshoes.com on Twitter. I would like the Fiona Quilted Mid Deep Plum. How fun would the plum color be for winter! Wow. Ok, this is hard. I usually only think about the best shoes for my 2 year old son, but me? This is awesome. The Patagonia Attlee Tie Waterproof Forge Grey sure do look fancy…and sooooo comfy. I would love to win the Patagonia Better Clog Boots in Deep Espresso. Gotta have a cute, comfy and stylish brown boot for Fall! So many great looking shoes and boots to choose from, it’s hard to make a choice. With cold weather just around the corner, I think I would have to go with the Nomad GTX. Love the Addie Rider High in Black. It’s so hard to decide, but I think my favorite is the Patagonia Fiona Quilted High Deep Plum (I have a weakness for purple), but the Patagonia Lugano Lace High Waterproof Forge Grey looks awfully nice too. I think the forge grey wins out, but it’s really close. I would love Patagonia’s Arrant Leather Gore-Tex® Jasper Green shoes for my husband. Thank you! Also I am so glad to gave found your website. Very informative. The story about the writers children being lead poisoned was very scary and real. I would love to try the Patagonia Fiona Quilted High Black. Also really love the pair of boots that you have. I like Patagonia P26 Mid A/C Gore-Tex® Forge Grey/Storm. They would be great for wearing in bad winter weather. I am so happy that Patagonia now makes shoes! I’ve long loved their clothes—and now my feet can be happy, too. 🙂 I would love to get a pair of the Better Clog Janes. They look super comfortable and stylish, too. I’d love the Merrel Encore Breeze 2. I’m in need of tennis shoes, and I like the Tsali running shoes in the Prickly Pear color. The red Addie boots are beautiful! I also like the Better Clog. I follow you both on twitter as ptowngirl25. I think I would choose the Addie Ruffle-they are so great looking! I would love to win the Nomad GTX boots for my hubby. He could really use some winter hiking boots and these would look great on him! We love Patagonia gear and put it to good use here in the northwest. But, I still have one concern: Even though thess eco-friendly boots are mad with 70% of recycled materials. Isn’t polyurethane still a great concern in health related issues? Please let me know, since I am very interested in buying one those pairs!!! Please delete my comment above! I love the Addie boots and the Addie ruffles! I follow Online on twitter @JCausby and like them and you on Facebook! I like you both on FB (Sarah Smile) and I would like to win the Patagonia Attlee Tie boot for women. I would love to win any of the Patagonia shoes! I love their Addie boots, but the slides are adorable too. Attlee Snap Waterproof by Patagonia are my favorite,cute and waterproof! Oooooooh, I like those Patagonia “Pau” shoes a lot! Some of the boots are super-awesome looking too. Very cool. Follow both on twitter @5memb. I love the Addie Clog Espresso. Patagonia Bandha T-Strap Black is so nice! i hope this is open internationally! Follower of both on Facebook as Jennifer Schmidt. I’d like to win the Addie Boot. I really like those Patagonia Attlee Tie Waterproof Naturals. Thanks! I’d get the Fiona Mid. Tough choice though! I really like the Nomad GTX shoes. Fingers crossed! I absolutely love Kork-Ease Alyssa Nero Full Grain boots. I like OnlineShoes.com and Eco Child’s Play on Facebook as Gaye M and I’d love to win a pair of Patagonia Fiona Quilted High Black Boots. I like Patagonia Tin Shed 6 Waterproof in Forge Grey. It’s a durable looking boot! This would be amazing! I would likely order the Fiona Quilted High in plum. Or the Fiona Quilted Mid in any color. Depends on the circumference of the calf-opening. But man, I need some cold-weather shoes! My husband needs new shoes – I think he would like the Scree shield. Wow, great giveaway!!! I love the better clog, but if I won I would probably choose a men’s boot – my boyfriend needs some hiking boots. The Better Clog Jane in Black! Looks stylish and comfy! I like OnlineShoes.com on Facebook. I like Eco Child’s Play on Facebook. My favorite is the Patagonia Kenosha in Black. i like both onlineshoes.com and eco child’s play on facebook. love me a pair of the better clog boots in black! I like the Patagonia Attlee Tie Waterproof Forge Grey. Ohhhhh, love at first sight! If I won I would get the Addie Rider High Chimney…the colors are perfect for fall, great blend of fabrics, and versatile for the city or a trip to the mountains! I’d love to win the the Fiona Quilted Deep Plum – how fun and sassy! It’s tough to decide :’( I would go for a pair of Patagonia Addie Ruffle (Peat Moss) because it can be versatile! I like the Addie clog…but it was hard to choose just one! Great giveaway. My choice would be the Attlee Tie Waterproof boots since they are super cute! Id LOVE the Patagonia Attlee Tie Waterproof in Black!!! Follow Eco Child’s Play on Facebook. I love the Patagonia Lugano Waterproof Black w/ White Trim! I like the Advocate Alaska Blue Print–would make a good slip-on house shoe. I follow both on Twitter dddiva & am having a tough time deciding but I believe the Dansko Brinkley Black Nappa is my fave. cool giveaway! i would love a new pair of patagonia Addie booots. love the brand. I love any of the tall boots and the addie ruffle boot. I never have the money for them when I see them, but I would love a pair! I love Patagonia shoes, especially the Addie Rider High Black! thanks! So many nice looking shoes on that website. I love the Naya Gemini! Super cute! I like the Addie Boot Chimney. I liked so many, the Better Clog was pretty nice! I LIKE OnLineShoes (HollyCunningham) on Facebook ((1955nursehjc4me(at)myway(dot)com)) TY! I really like the Patagonia Bly Mid Gore-Tex Sable Brown Women’s Boots. I really need a pair of hiking boots and these are perfect! I LIKE YOU (HollyCunningham) on FB, too!!! ((1955nursehjc4me(at)myway(dot)com)) New follower, Thanks for the chance…. Ooooh – picking my FAV was hard, but here goes: #1 Addie Ruffle boot #2 Attilee tie boot #3 Addie clog #4 Advocate shoe – Like Patagonia on FB, too!!! ((1955nursehjc4me(at)myway(dot)com)) I’m keeping my fingers crossed…. love the Maha Sable Brown!! Thank you!! The Patagonia Addie Ruffle Peat Moss boots are cool! I love the addie boots or the addie ruffles! I love the Maha shoes! Thank you! Fiona Mid shoes for me I would have to say. I love the Drifter gore tex shoes! Thank you! I’d love to try the Specter. Eco-friendly trail runners- Id put them to good use!! Thanks so much for the chance to win some shoes! I like Patagonia Tin Shed 6 Waterproof ! Spectra ultramarine would be great to try out! Thanks! I love the Addie Boot, the Better Clog and the Fiona quilted boot! They have great styles and I love their business practices! I keep eying the boots and reminding myself I have a decent pair of waterproof boots. Still love the Fiona Quilted High Deep Plum, but I suspect the P26 Mid A/C Gore-Tex® Forge Grey/Storm would be more practical. loved the Bly Hemp…I might really need those. I love the Addie Ruffle. Awesome giveaway. The Patagonia Fiona Quilted High Black. We live in the East Coast and with winter comes snow; a lot of snow. These boots are tall and waterproof and CUTE!! Keeping my fingers crossed! Since I hope I am the winner of the Patagonia hiking boot – in addition to that, I’d also like a pair of Harley Davidson boots (my husband just bought a motorcycle)! Heck Ya! Patagonia is a company I’m happy to support even during tough economic times. I love the Patagonia Addie Rider High in Chimney. Gorgeous! I think I would choose the Maha shoe. It looks comfy and yet you could wear it with a lot of different outfits. I really need that combo being a mom. As much as I love getting out in the woods, I need something for everyday wear and those look great. Thanks for hosting this giveaway!